New York City’s Freedom Tower is currently 5 stories high, and as it grows taller and taller it could take up to 45 minutes for construction workers to get to the bottom, making it impossible to go out for lunch during their half hour break. That’s why the project’s contractors have hired sandwich maker Subway to build a restaurant at the same level as the ongoing construction. Last week, the franchise hoisted nine shipping containers alongside the tower, which will serve the construction workers with the same menu offered on street level – even the freshly baked bread. 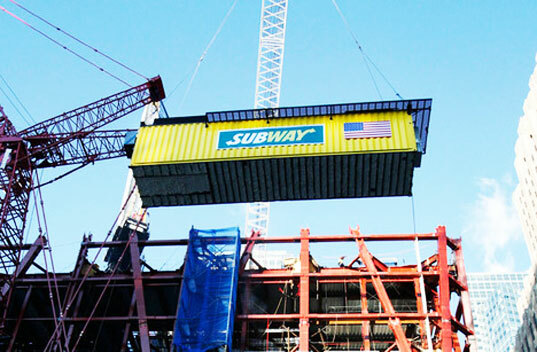 The 9 shipping containers, all painted bright yellow with the Subway logo and an American Flag, form a 3 story structure stacked on top of a hydraulic platform. As work is completed on the Freedom Tower and a next level is added, the Subway restaurant will also be raised up to be able to serve meals to all the workers. A new level is expected to go up every week or two for a total of 105 floors, which will make this Subway the highest franchise in the world when it gets up to the top. Opening in January, the shipping container restaurant will also serve some New York City favorites not found in other franchises: hot dogs, hamburgers and pretzels. Prices for Subway’s sandwiches will be the same as they are on the ground in order to serve the workers, and not necessarily turn a profit. The 3-story structure will have a full kitchen refrigeration, an eating area, storage and trash, with a compost unit to recycle waste. Hopefully when the tower is completed in 2013 the hydraulic shipping container Subway restaurant can be used at other construction sites. New York City's Freedom Tower is currently 5 stories high, and as it grows taller and taller it could take up to 45 minutes for construction workers to get to the bottom, making it impossible to go out for lunch during their half hour break. That's why the project's contractors have hired sandwich maker Subway to build a restaurant at the same level as the ongoing construction. Last week, the franchise hoisted nine shipping containers alongside the tower, which will serve the construction workers with the same menu offered on street level - even the freshly baked bread.